Everyone sends newsletters these days and for good reason: they work. But what emails are you sending to specifically ensure your customers come back and buy again? None? Well, you’re not alone! Customer retention is a complex beast and understanding ways you can use email to increase your customer retention will lead to a direct increase in the amount of money you make from your customers. 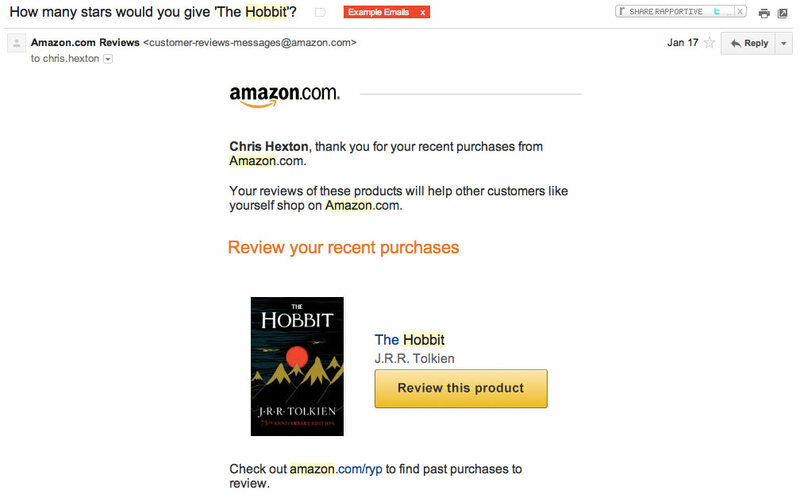 Here are five great examples of retention emails from online businesses that know their stuff. Use them for inspiration! Attracting the right customers. You want to attract as many of your ‘ideal customer’ as possible. An ideal customer will get maximum value from your product(s). They are loyal. By their very nature these businesses will stick around for a long time. Activation. Just because a customer engages with your business doesn’t mean they’ll actually buy. This is particularly true in the world of online software: if someone puts their card down for a free trial it doesn’t mean they’re going to stick around. You have to make sure that every customer actually takes the key activity or activities that represent an active user. By ensuring customers activate in the first place you give yourself the best chance at increasing your retention rate. Follow up. Even if you’re acquiring the right sort of customers and activating them rapidly it’s super important to continue to monitor customers that go inactive and to prompt them to come back and use your software or purchase again. To maximize retention, spend a lot of time ensuring your customers don’t leave. So, with those factors in mind how can you use email to increase retention? For Dropbox, no install = no business. 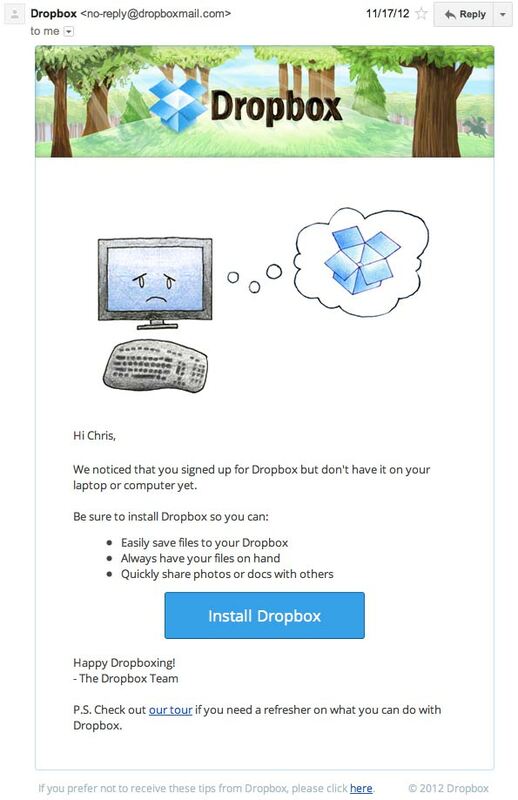 You’re never going to become a paying customer year-in, year-out if you don’t install Dropbox in the first place so they spend time focusing on getting you to install. Cute, simple, on-brand. This is the sort of activation email you should send your customers if they haven’t taken your core activation action. Find your core activation metric. For Twitter this was getting customers to Follow more than 30 accounts. 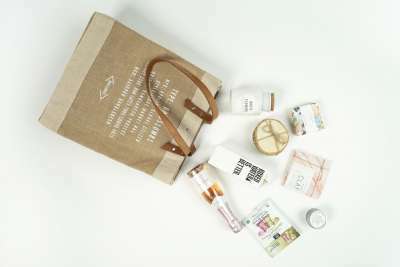 For Vero (my business) it’s getting customers to send their first email and so on. Email customers who haven’t taken this action within three days of signing up for your business. Make the call to action direct and make it easy for customers to get in touch and seek help! Kareem, founder of SocialWOD, is a switched on guy. 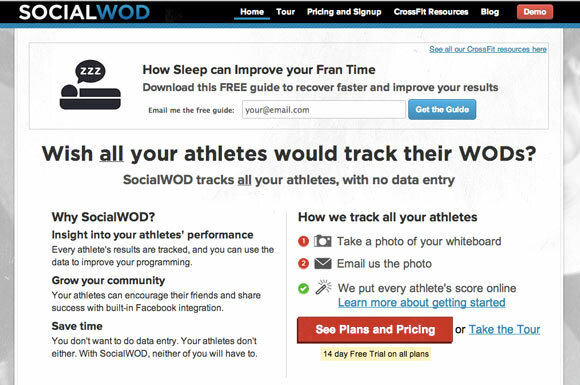 SocialWOD helps CrossFit trainers keep track of their customers’ daily workouts. Kareem identified that customers needed to better understand the value of his product before feeling comfortable becoming a customer. Once they understood the need they often became loyal customers who would use his service for a long time. He decided that the trick would be getting prospective customers to understand what SocialWOD is all about. Short of calling each and every customer for an hour, which isn’t ideal for a product business, Kareem got inspired by deconstructing WPEngine’s speed educational email course, as discussed by Patrick McKenzie in his Lifecycle Email Course, and wrote an educational email campaign. Kareem’s campaign consists of 6 emails sent over 21 days designed to educate customers about SocialWOD and daily activity for FREE. He doesn’t sell the customers directly, instead he gives away the solutions to the challenges his customers face and, implicitly, brings his potential customers around to the idea of buying SocialWOD to make their lives easier! You know so much about your business’ area of expertise. You spend 24/7 thinking about it! Write 5-8 emails sharing useful, educational and free content about your business’ problem area and offer it to customers via email. 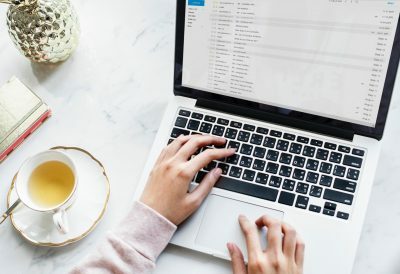 This really detailed post on using educational emails to build trust with potential customers will give you lots of ideas on how to replciate this campaign with success! Amazon are an email marketing powerhouse. They have some of the most sophistacted lifecycle marketing campaigns in the world, so it’s only natural we should look to them for inspiration! Amazon spends a massive amount of time optimizing user flows and driving customers back to Amazon.com. Getting your customers back on your site is a golden opportunity to get them to interact with new features or buy products. Why is this super slick? It drives customers back to Amazon’s website even though the customer initially they initially interacted on the Kindle which exposes the customer to a full range of purchases: not just more digital books. You can bet this is good for Amazon’s bottom line. It’s not sales-y at all. It’s a clear, simple email that really encourages you to take the key call to action: rate the book. Target customers who have bought from your business before and ask them for a review or recommendation. Not only is this best practice but, for an eCommerce store, it is a genuine means of bringing customers back to your website to purchase again. Implement a campaign like this in just a few hours and you’ll increase your customer retention permanantely. Flightfox are a crowdsourced flight search provider. They’re a data-driven team and email means a lot to their business. Having previously written about how lifecycle emails helped them increase their sales by 10% Flightfox are now sending an email to some customers who have previously completed a flight contest and taken a trip. This email converts repeat customers at a rate of around 3%. That’s impressive and it’s fantastic that they are increasing their permanent repeat business using a single email. 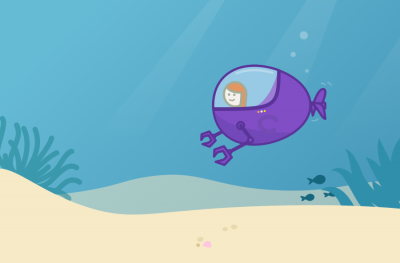 Where in your funnel can you bring customers back to purchase again? Find this point and automate an email that reminds customers you exist and gives them an incentive to come back. Pro tip: Experiment with your offers and copy. It might be well worth it to offer first time repeat customers a little bonus to get them over the line but it might be enough to simply email loyal customers (who have purchased three or more times) with a simple reminder. Emil is the founder of HelpJuice, a tool that helps businesses automate their support by making their Knowledge Base super awesome. I’m sending you this message since you signed up for Helpjuice recently. 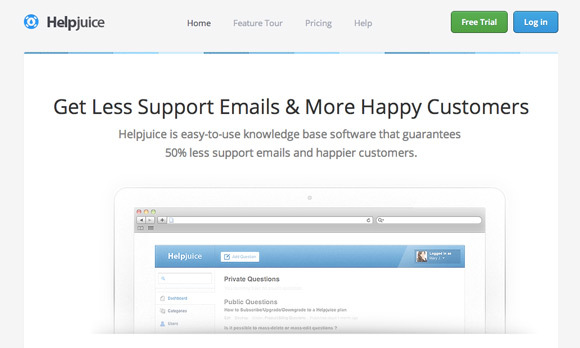 I wanted to share with you something dead simple that EVERY single Helpjuice customer has used to save 1,000,000+ support emails (that’s a lot of time saved) and happier customers. It’s pretty interesting actually. Companies like Amazon, Coastal.com, Microsoft, Indeed really focus on automating their support..and not too many people know about how they do it. This email, along with it’s follow-ups invites customers to attend a weekly webinar that teaches them how the big guys reduce customer support times. The email is fantastic as it creates urgency, encourages customers to engage with HelpJuice and activates customers rapidly. Emil has shared this this lifecycle email has doubled his customer lifetime value. That’s a massive improvement and something we should all aim for. Every business has content they’re using for marketing. Re-purpose this content and offer it to new users as a value add. Make the content practical and ensure it helps them start using your product(s). This could be a video, a webinar of your own, a slideshow, an eBook – just make it practical, to the point and relatively short. This concept works because it gives you a chance to really educate your customer and also gives them a sense of ‘value’: you’re providing exclusive content to help them solve their problems! A customer who sees this value will become a loyal customer much faster than one how doesn’t and this leads to a direct increase in retention. These five examples come from companies of all sizes but they all have two things in common: they’re successful and they’re growing AND they use email marketing to increase their customer lifetime value. Increasing your retention rate means you see a better ROI from each and every customer you sign up. This gives you a better business, optimizes your cash flow and gives you a ‘better machine’ to work with! Spend as much time optimizing for customer retention and lifetime value as you do on customer acquisition and you will be amazed at the growth. Pick one of the campaigns above that is relevant to your business and set it up today. A few hours investment will pay off forever! What do you think of these campaigns? What other retention emails have you seen and responded to? Let me know in the comments! Chris Hexton is one of the founders of Vero. He lives and breathes email marketing 24/7 for his customers and you can follow him on Twitter or connect on LinkedIn.